When I saw that MANGROOMER had a brand new Back Shaver, their newest and top of the line back shaver, with a 50% larger Body Groomer head. I had to go out and get one and review it immediately, and this is my review of the Mangroomer Lithium Max Plus Back Shaver review. Let’s cut into this blister pack and get into this review. After all, their model before this was truly impressed me and made my list of the top 3 back shaver. 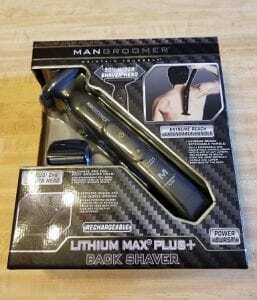 To see that review head on over to my review located here, Mangroomer Lithium Max Back Shaver Review. With such a strong showing from Mangroomer before I knew this back shaver just had to get better. As stated above, this is the new top of the line back shaver from MANGROOMER. With a proud 15 years of research and development currently this is their pinnacle for a back shaver. To start off let’s start with the basics. This is a rechargeable cordless electric back shaver. Using a lithium battery for fast charging and able to hold a longer charge between charging. This also comes with two different shaving head attachments that are interchangeable, by simply twisting the head to the right and twisting to the left to put back on. They also even provide a locking mechanism to prevent accidentally twisting the head off when shaving. The wider shaving head (back shaving head) is used for knocking down the long back hairs, while the Body Grooming head (foil type) is used to get a smooth shave on the shorter hairs. Power Hinge on all attachment heads. 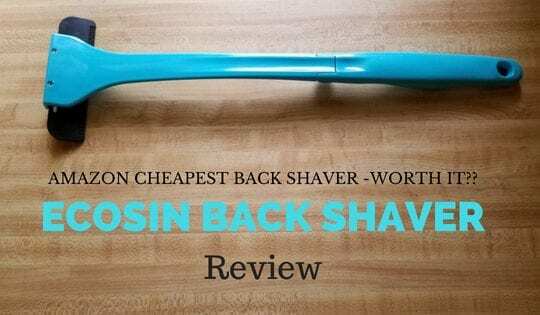 Allows for just the right amount of giving when shaving the different contours of your back. Power Burst button to get instant access to power when needed. Pro XL Extendable Lock – Press this button to get more reach on the lower portion of the handle. From starting out at 9 1/4 inches to the press of the button to 14 1/2 inches. Locking button below where attachment heads go to adequately hold heads in place. Power Hinge – Located in the middle of the handle to give a very versatile option of choosing any angle from 0 degrees to 135 degrees. So, what is the difference between this model (Plus+) and the older version? Well, a couple of things worthy of note. The biggest and most important is the wider grooming head. This is for usually used first as this is supposed to tackle the longer hairs. The Grooming Head comes in at 3 inches, and the cutting edge of this is 2 9/16 inches wide. Compared to the older versions, which is 2 1/8 inches head and a 1 3/4 cutting edge. So you get 13/16 of an inch more for a slightly higher price. My opinion = WORTH IT. A less worthy of noting is the color change from black and red to all black with white lettering. It looks like a more serious tool and in my opinion better. 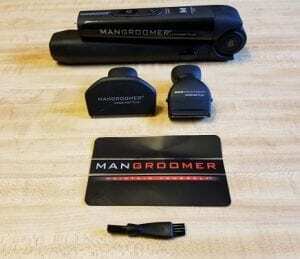 How Well Does The ManGroomer Max Plus Perform? 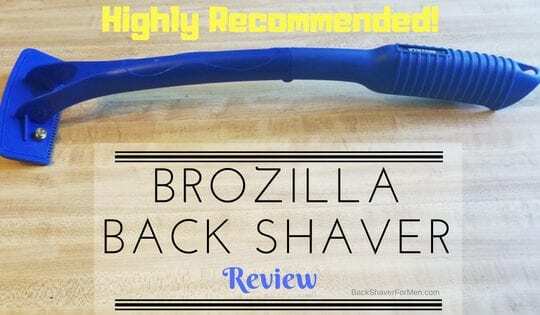 To sum it up in the first line, This is the best electric back shaver out there and not only that, it is one of the top back shavers on the market today. A great choice for anyone! This will trim and shave your back hair pretty quickly, while not as quickly as razor will. As you will be using two attachments and going over your back twice. Effectively removes back hair with each pass. Providing a close enough shave to please just about anyone. While also providing a great trimming aspect as well, as some men prefer just trimming their back hair as opposed to shaving. As they don’t like the itchiness of hair regrowing after shaving. The handle is just freaking amazing on this shaver. Providing a very solid and comfortable grip anywhere on the handle. The weight is also perfect, as it is very light and wielding. Having a slightly heavier weighted front end lends itself quite well to shaving the back. Great options and many angles to choose from. The options for the many different angles, as well as lengths, will leave you very happy. Not much arm contortion is needed at all to reach previously unreachable areas of your back. It works just naturally, without having to really think about it. What Is All Included With Purchase? 2 – Attachments Heads -The foil shaving head comes in at 1 1/2 inches wide and the grooming head comes in at 2 1/2 inches wide. 1 – Two-sided cleaning brush. 1 – Detailed instruction pamphlet. 1 – Black 2 year warranty card with contact information. This makes shaving your back a pleasure, number 1 and number 2 it works great! THE BEST ElECTRIC BACK SHAVER OUT THERE PERIOD. Never having to buy replacement razors ever again just to shave your back. Multiple speed settings, regular and power burst. 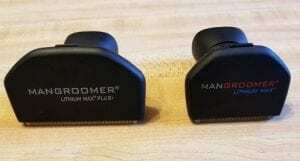 I personally just use the power burst when using Body Groomer head attachment (the wider one) and switch back to regular speed for the Back Shaver attachment (smaller one). Head attachments are quick and simple to change. Takes just seconds. Replacement heads are available for purchase if you need to replace one. Thereby not leaving you with a hunk of junk if a head has stopped performing. They are pretty reasonably priced too! Since I have the older version (Mangroomer Lithium Max) and the newer version (Mangroomer Lithium Max Plus+) I decide to see if the heads are interchangeable. They are!! I switched them back and forth both ways, and both worked great. No problem at all. I love this handle. Fits the hand nicely and can adjust your grip on just about anywhere on it. With all the design features built into this back shaver, I was EASILY able to hit all areas of my back. Did I stress the word EASILY enough? Fully adjustable handle. From the storage position of 0 degrees all the way up to 135 degrees, you are sure to find the correct position for any place on your back. The degrees are a space at 15 intervals. So you have a total of 9 separate positions in which to choose from. Extended reach option, as there is a button located on the lower half of the handle labeled Pro XL – Extension Lock. This gives you the option of extending it up to another 5 1/4 inches or anywhere in between. Absouloouty zero cuts or nicks when shaving with either head. A serious company that has invested years and money into product development. I love the solid clicks when adjusting the degrees. As this means two things, well built and it won’t move on you when using it. Additionally, there is a black locking button located in the center of the handle to ensure it doesn’t move on you 100%. Great instructions manual. This is also provided in multiple languages, English, Espanol, French, and German. Definitely worthy of reading to get the components down in your head, as well as getting the most out of your lithium battery. Lithium battery. Best battery for fast charging (2 to 3 hour charge time) and holding a charge for three times longer. Folds up for easy storage. Also on Amazon, you can purchase a travel case designed for the Mangroomer. Mangroomer provides a small two-sided cleaning brush to effectively clean your attachment heads. Allows you to be self-sufficient and shaver your own back. Saving you time and money. Can be used additionally for manscaping. Surprisingly very lightweight and easy to handle. A charge indicator light is located on the handle to effectively tell you if you need a charge or not. Color upgrade from the previous model. I prefer the look of this new all-black model compared to the last model. You must initially charge your Lithium Max Plus+ a minimum of 18 to 24 hours before using it. Read the directions to ensure battery performance. Not that a big of a deal but I thought I share anyways. Increased shaving time to get a really smooth shave initially. As this system uses two separate heads to rid your back of hair. I also didn’t find it that much of an inconvenience, as far as time is concerned but there is an increase. Having improved the width of the head was a real step in the right direction for Mangroomer, but bladed versions of other back shavers come in at 4 inches across. High Price. This is the highest priced back shaver I have reviewed but it doesn’t need replacement razor blades either. I like using the power burst setting to shave down the longer hairs initially with the groomer head. Then switching to regular mode when using the foil shaver. This seems to work great for me. Feel free to extend the handle and adjust the angle and play with it to find what works best for you. You will find it will reach all of the areas on your back easily. Read the instructions manual to fully understand this shaver components and battery. A real quality electric back shaver that performs head to head with some of the best manual back shavers out there. Providing the best technology currently available in the form of battery performance with it Lithium Max+. Some many things this company gets right and it’s great to see they want to keep improving their product. Some many positives, it’s hard not to love this back shaver. A definite step up from the previous model. Good job MANGROOMER! Improvement is always welcomed! Shaving time is reduced with the wider upgraded head. Still needs to go over your back twice with different heads. Amazing adjustability in the handle. Virtually no discomfort after a shaving session. 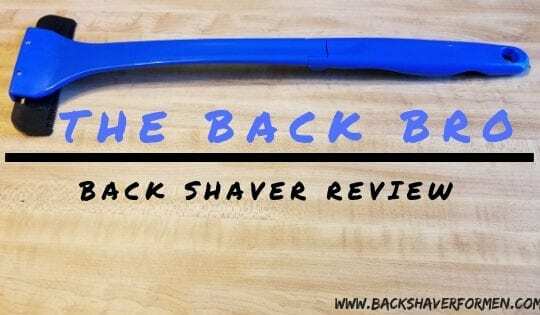 ← BAKBLADE 2 Review – Best Back Hair Removal For Men? Yes, this will work nicely on other areas of your body, not just back hair. The company warns of using it anywhere on your face, as it is supposed to be used anywhere below the neck. Hope this clears it up for you. 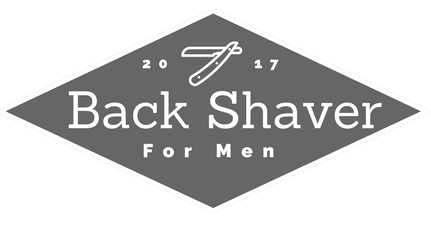 Mangroomer is a great company with exceptional shavers. 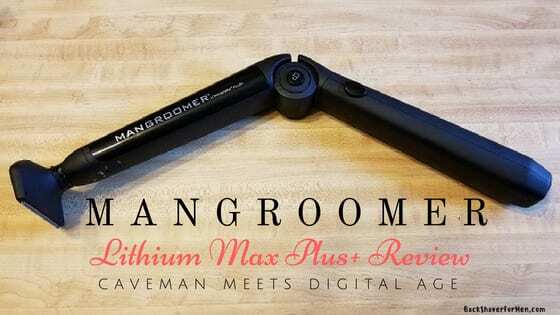 Take a look at the very newest Mangroomer Lithium Max Plus I just did a review of this on May 11. A wider head that makes back shaving even easier.